Expert interviews, epic guides and deep-dives, and no irrelevant fluff and bro-science... all tied together by my mission to make EVERYTHING you listen to as actionable and practical as possible so you can use the information in your training and racing. If you're not into listening, no worries. I take all the show notes for you so you can read if that's your preferred medium. 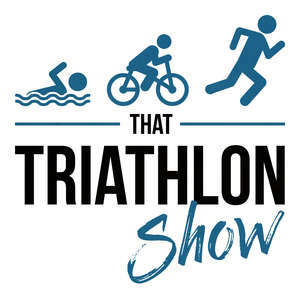 A new episode of That Triathlon Show has been released every Monday and Thursday since the end of February 2017. So the archives are full of fantastic content by now. Enough to keep you entertained for many, many indoor trainer rides. All episodes in one handy player. Listen directly or download to your device. My goal is to get 200 5-star ratings for That Triathlon Show within the year of 2018. If you find value in the podcast, please help me reach my goal by leaving a rating and review on iTunes. My 45 minute commute through Northern Ontario (Canada) just got a whole lot better thank's to That Triathlon Show. The content, guests, delivery etc.. has fueled a fire that has been smouldering for years and inspired me to dive into the world of Triathlon as a participant. Fantastic show Mikael that I look forward to cuing up every morning. Thank You! The highlight of my listening week, currently probably the single greatest podcast resource for triathlete's of all levels. Incredible guests and a fantastic, approachable presenter with great ideas. Keep it up Mikael! ​Mikael asks the questions that no other podcasts seem to. He really gets to the specifics with his guests where other podcasters tend to avoid asking for such information. He has a healthy obsession for more knowledge and especially the knowledge that podcast listeners want to here about triathlon. ​I started listening to this podcast a couple of months ago, and enjoyed it from the very first time. Each episode covers a different nuance of triathlon, including lots of training tips, nutrition advice, brain work.. Mikael provides scientific research results to back his statements, making this a very factual, relevant and overall interesting and stimulating listening experience. I highly recommend this podcast to anybody who wants to be an informed triathlete. ​My wife, suunto, polar, rovio, nokia, salmiakki, four sigmatic... and now 'that triathlon show' are some of my favorite exports from Finland. Mikael does a great podcast that balances leading scientific thinking with everyday and practical calls to action. It's now part of my routine. I really hope That Triathlon Show can have a positive impact on as many triathletes as possible. Many listeners have been writing me about how they have got their entire tri clubs to listen to the podcast. If you have even just one friend or acquaintance in triathlon, please tell them about the podcast. Chances are there's at least a few epiodes that they can learn something really important from. Also, consider sharing the podcast on Social media, now and whenever a new episode is released. Plus, subscriber-only scoops from the off-air chats with interview guests when relevant!